A friend of mine picked one of these up a while back for £99.99. He keeps mentioning how good it is and I've just spotted that its reduced to £79.99 which seems a good price for an inflatable kayak compared to some I've seen on amazon. Seems to have a few good reviews from people who have purchased it on there too so if your a bit of an outdoor type might be worth a look. Has free delivery as well though that seems to end on the 26th August a few days before this offer ends! if in store, students get 10% off too. I bought one of these and tried to light one of those little disposable barbecues in the front as it was getting chilly. However it melted right through and I nearly drowned. It was a valuable learning experience. Proved once and for all that you can't have your kayak and heat it. Proved once and for all that you can't have your kayak and heat it. I bought one of these and tried to light one of those little disposable … I bought one of these and tried to light one of those little disposable barbecues in the front as it was getting chilly. However it melted right through and I nearly drowned. It was a valuable learning experience. Proved once and for all that you can't have your kayak and heat it. Canoe explain it to me? can we stop the jokes, it getting oaring now. someone always has to stick their oar in..
seriously do you get a paddle with this or am i up a creek ? I haven't a clue if this is a great deal but at least it is nothing to do with computers for a change so have some heat just for that. Retards are out in force again, just spam the deal before it hits number … Retards are out in force again, just spam the deal before it hits number 1 purely because some idiots like making pathetic jokes. i want to fart on your head. No paddle included, thats another £15 according to site, seems a bit odd. I have looked at these on and off in the past, but always put off with the thought that British waterways are full of junk that will no doubt easily puncture a boat of this nature. Job to see what the cockpit is like with this so can't tell if there's foot rests or a back band, both things make paddling a lot easier. Can't get much better for the price though! Allow £60-£80 for a paddle and bouyancy aid too. No paddle included, thats another £15 according to site, seems a bit odd. … No paddle included, thats another £15 according to site, seems a bit odd. I have looked at these on and off in the past, but always put off with the thought that British waterways are full of junk that will no doubt easily puncture a boat of this nature.Any experiences? Just hope it's not a let down for those who buy one. You won't be going over any portages with this. I was close to buying one but then saw a member on ebay selling a tandem (not sure if I can post link but it's auction ID 170897826007) for £52 delivered. Looking at their 100% feedback lots of positives for that particular item. I'm looking for a kayak which I can use on a canal and open sea, I wanted a playboat so I could take it away too but they would be too much hard work on the casual trips. Does anyone have any experience with this or the tandem on canals/open water? Cheers rogercat, no idea how I missed those reviews! Use it to fake your death and move to Panama with a new identity. Didn't someone try that? I can't seem to find more info on the specs. I've tried Google but couldn't find anything. Does anyone know how heavy the kayak is? can someone tell me what this deal is a boat? It weighs just over 9 kilograms.Can support up to 20 stone.I will not be able to transport my Frenzy kayak with my next car so I have gone for one of these. Julian Assange just ordered one --- do you think it'll get to Ecuador? 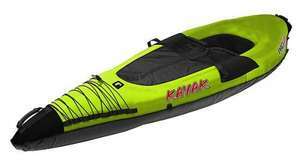 Hi all i was thinking of buying this inflatable kayak but couldnt find any true reviews of it....has anyone actually seen one, bought one or used one...? if so let me know. Looks all-right to me. . . .hmmm. Do I or don't I? anyone drowned in one yet? I've just taken a look at my kayak, given it a clean after 3 years stood doing nothing. Got a damn hole in the front. I think it's from when I moored up on the tidal Thames and it got flooded forgetting how high the water goes.